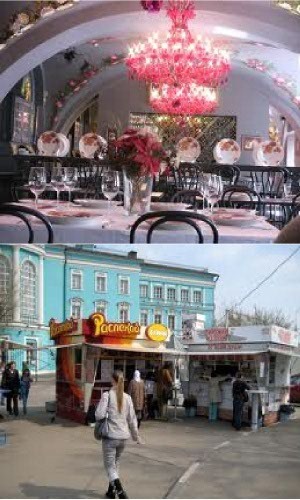 Here you can read where you can eat fast and cheap food in different cities a long Russia. We list below different places where you can taste the most typical and popular meals of Russia but in a fast Russian style. We also mention which International fast food opened their locals in Russia the last years. Cháinaya Lozhka (in English the spoon), is the chain of Russian fast food well know and with accessible prices. The first store was opened in 2002 in St. Petersburg and has been so successfully, that now in St. Petersburg they have about 30 restaurants and are expanding to other cities in Russia with a system of franchises. They are Pancakes (Blinnaya in Russia), where the main dish are Blinis, (the Russian traditional dish). They can be served without a filling, or with flavorful fillings (likes mixtures of meat, vegetables, etc.) or sweet (curd, jam). They also serve salads and some soup. The main drink that they offer is tea, which is the typical Russian drink and especially to accompany the blinis. In these places there are usually many students and young people. The locations of Cháinaya Lozhka are easy to recognize by their orange colors. Pirogi - Stolle (known as pies in English is a fast food chain that was founded in 2002 and now has stores in Moscow, St. Petersburg, Ekaterinburg and Yaroslavl. Their original idea was to recover the tradition of making pies ("pirogí" in Russian) since the beginning of the 20th century using Russian traditional recipes, so the interior design of their stores are stylized as the beginning of the 20th century. They also serve other traditional dishes such as soups, salads, meat, etc. Kroshka Kartoshka and Chudo Kartoshka (known in English as the miracle potato). These two fast food chains are also original of Moscow, but they have branches in St. Petersburg and Novosibirsk l. The main dish is an original idea is a big potato made baked and crushed with cheese or meat, and you can add ingredients or fillings of all kinds (like mixtures of vegetables, cheese, meat, chicken, sauces) that they are in the showcase so you can choose what you like. They also serve soups, salads and rich desserts. You can order food to carry. People in Russia (especially women) are very gluttonous and they love tea or coffee with pastries, cakes, desserts and sweets. They like to eat at home, in cafes or bakeries. That is why, the chains of bakeries like Sladkoezhka (in English greedy) and Ideálnaya Chashka" (in English ideal Cup) has a great success and their bakeries are multiplying. In addition you will find the international fast food chains like McDonalds which is present in the Pushkin square since 1990 and currently has more than 279 premises. Burger King with 22 locations in two years located mainly in shopping malls. The chain Carl's Jr. has at the moment 17 restaurants in the cities of St. Petersburg and Novosibirk. Another chain of burgers and American fast food, Wendy's, has two restaurants, Subway sandwiches chain has opened 200 stores in Russia through franchises.